Ohioans were among the earliest and most prominent pioneers in the use of electricity. Leading the way, in 1879, Charles Brush developed arc lighting, providing an easy and cost-effective way to light cities at night. Brush introduced his invention in Cleveland, Ohio, making this city the first one in the world to have electric streetlights. 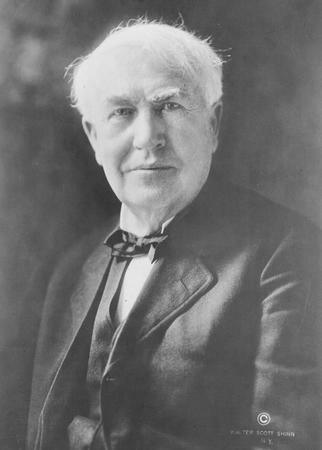 Ohioan Thomas Edison developed a usable light bulb, among dozens of other inventions utilizing electricity. Benjamin Lamme accumulated 162 patents, most dealing with improvements in electricity's use, during his lifetime. These men's discoveries and inventions helped Ohio to emerge as a leader in industrialization during the late 1800s, as business owners applied electricity to their factories. By 1900, most major cities in the state had electric streetlights. These communities also commonly had electric railways, connecting the downtowns of the cities with the suburbs. Most homes in Ohio's major cities also had access to electricity. While Ohio's major cities quickly utilized electricity, rural communities had limited access to this power source until the 1930s and 1940s. It was not until President Franklin Delano Roosevelt, during the 1930s, signed into law the Rural Electrification Act that many rural Ohioans benefited from electricity. In 1937, only ten percent of Ohioans living in rural south-central Ohio had electricity in their homes. By 1948, the percentage of these Ohioans had risen to nearly seventy-five percent. This same year, Ohio plants were the third largest producers of electricity in the United States. Industries utilized three-quarters of the electricity that these plants produced. Coal plants generated most of Ohio's electricity in 1950, and the same holds true at the start of the twenty-first century. Power plants utilized coal from Ohio, Pennsylvania, and West Virginia to convert water from Lake Erie and Ohio's many rivers into steam, generating electricity. The majority of Ohio's electric generators avoided converting to nuclear power during the second half of the twentieth century for several reasons. Many Americans feared nuclear power and potential accidents. The high costs to construct a nuclear facility also prevented most business owners from abandoning coal-powered plants. During the late twentieth and the early twenty-first centuries, electric power costs continuously rose, especially as federal government regulations required power plants to generate less pollution. Unfortunately for electric plant owners, most types of coal are not a clean-burning fuel. Business owners passed the costs of reducing pollution to the consumers.